Like everything else, bikes have a beginning and often an end. Over the years, I’ve retired a number of bikes. 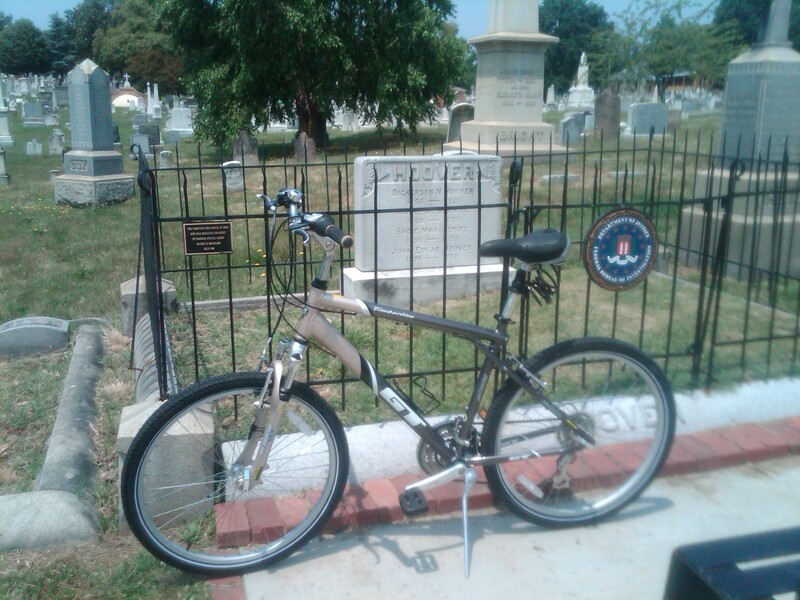 And in much the same way that Ben and Jerry’s retires an ice cream to their flavor graveyard, I pay tribute here to some dearly departed bikes that are gone, but not forgotten. This 1996 Deep Teal Cannondale H200 was purchased from another former bike mechanic who was helping to make ends meet by fixing up and selling used bikes on the side. He had a small basement shop in northwest D.C., near Meridian Hill Park, and is also someone I have gone to for tune ups or repairs for some of my bikes. 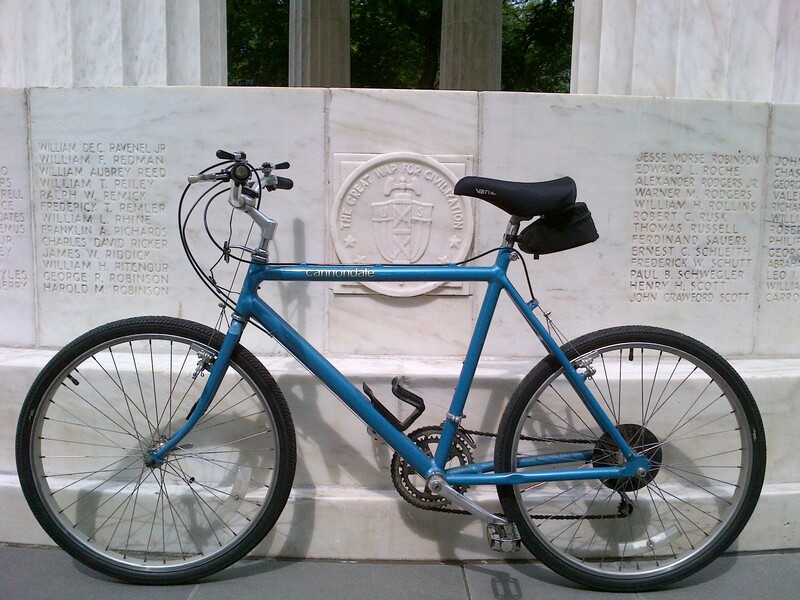 This classic 1985 Cannondale SC300 Town and Country is a casual bike that combines the comfort and performance of Cannondale aluminum with low maintenance, durable components. I found it locally on Craigslist, and used one of my lunch hours at work to test ride and then buy it. 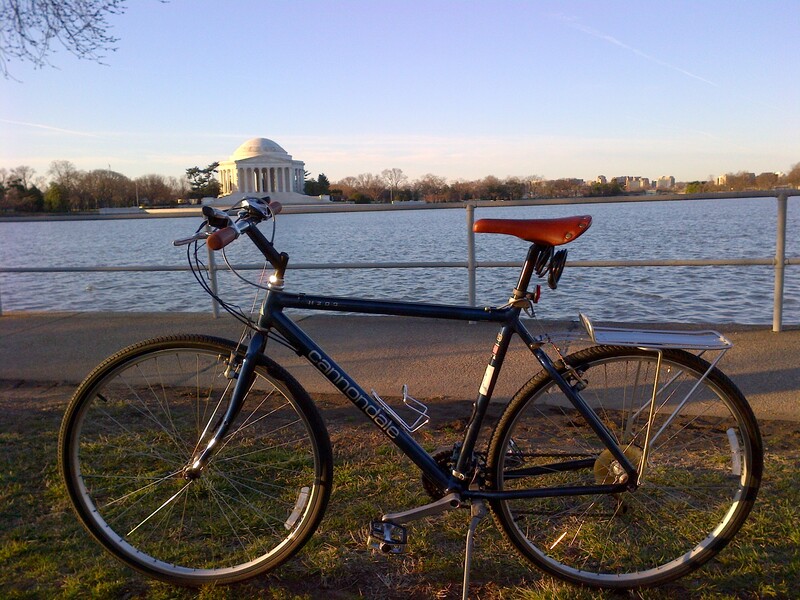 I bought this 2005 Blue/Dark Blue Trek 7200 Multitrack at Phoenix Bike Shop, located in Barcroft Park along the 4 Mile Run Trail and Washington and Old Dominion Rail Trail in Arlington. The Phoenix Bike Shop is a 501(c)3 charity, and their mission is to educate youth, promote bicycling, and build community. They do this mainly through their Youth Education Program which teaches 12-to-17-year-old at-risk juveniles how to fix bikes, run a bike shop, and serve the Arlington Community. Youth can join at their Barcroft Park shop location or at one of the Arlington Public School partner bike clubs. And upon completion of the program each youth has the opportunity to rebuild a bike which they then get to keep. This 1997 GT Nomad was purchased used from The Village Skis and Bikes Shop, which sells both used and new bikes. I happened upon it because the shop is located next door to a studio where my daughters took dance lessons. After dropping them off one evening, I spent the time waiting for the lesson to end by walking around the bike shop next door. By the end of their lesson that evening I owned another bike. 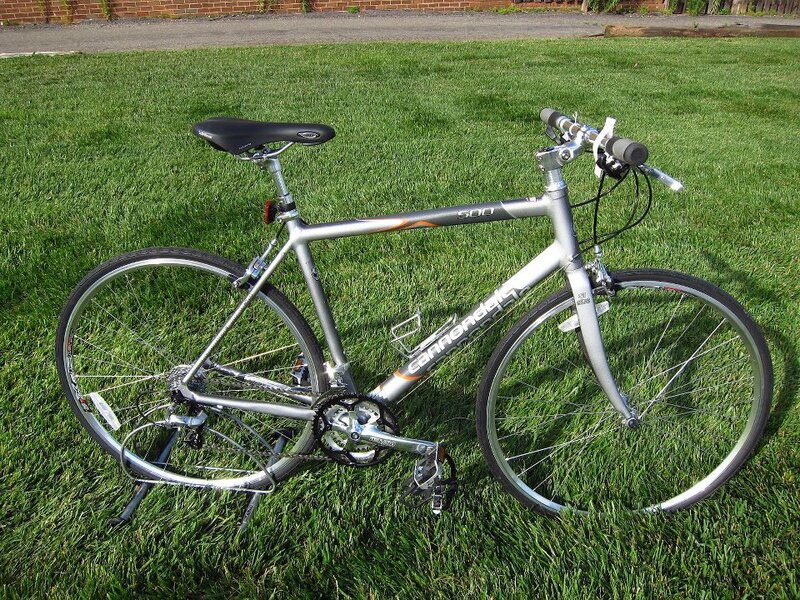 This 2006 Silver and Grey Cannondale Road Warrior 500 was purchased at a local bike shop named Bikes of Vienna, where it was being sold on consignment. I was familiar with Bikes of Vienna because they are a local recumbent bike shop where I have taken different kinds of bikes out for test rides. This bike was one of five of my bikes (along with the 1996 Cannondale H200, 1985 Cannondale SC300 Town and Country, 2005 Trek 7200 Multitrack, and 1997 GT Nomad) that were accidentally thrown in the trash when my employer remodeled one of three areas of the parking garage where bike racks were located. 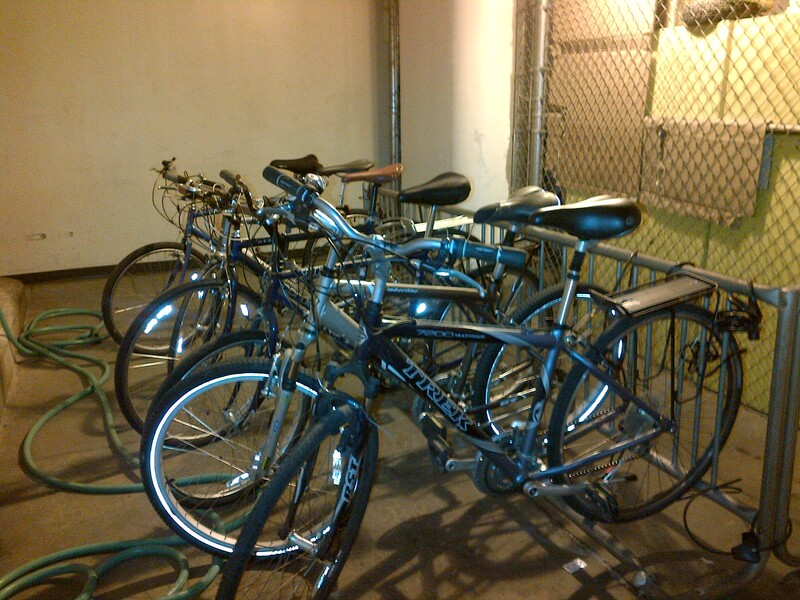 Upon returning to work after being out for several weeks with a broken leg, I found that the bike rack had been removed along with five of my bikes and several more bikes belonging to other people. Thinking that my employer’s failure to properly notify employees to remove their bikes during the remodeling constituted negligence, I decided to file a claim requesting reimbursement for the value of the bikes. So I filled out an official “Employee Claim for Loss or Damage to Personal Property” form, in triplicate, and submitted it to the unnamed agency of the Federal government for which I work. I was subsequently paid for the value of the bikes, as well as the bike computers, rear racks, locks, water bottles, and other accessories. So the good news was that financially I basically broke even on these bikes. And the better news was I now had money to buy more bikes. This 1991 Blue Specialized Hardrock was the first bike I bought to keep in the parking garage of my office building so that I could ride during my lunch breaks at work. It was for sale on Craigslist, listed by someone who told me he was a freelance writer who worked his way through college as a bike mechanic and was now augmenting his income by reconditioning or restoring bikes. This sturdy steel-framed bike lasted many years, and rarely needed servicing or repairs. When I finally decided to retire this bike, I donated it to Gearin Up Bicycles. 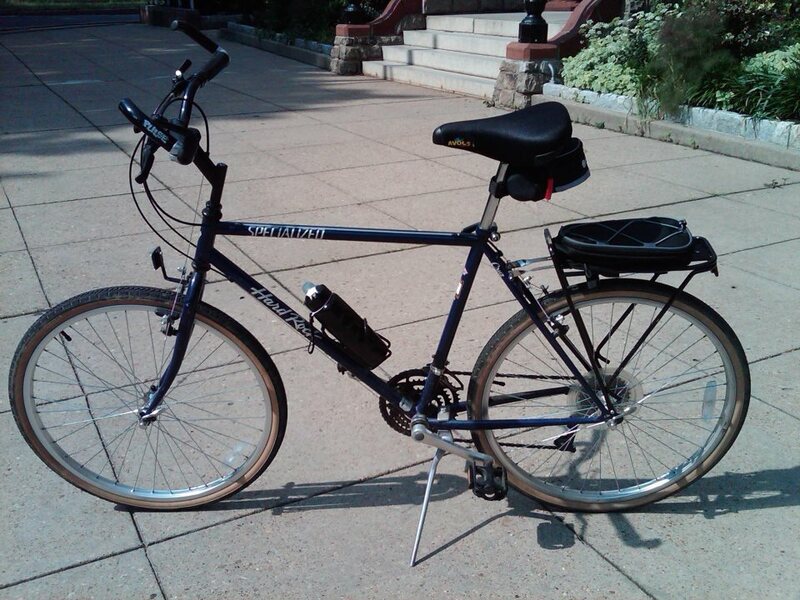 Much like Phoenix Bike Shop where I bought my 2005 Blue/Dark Blue Trek 7200 Multitrack (see below). Gearin’ Up is a 501(c)3 charitable organization that runs a youth program whose purpose is to create career development opportunities and teach essential workplace skills to teenagers from underserved communities, while encouraging cycling as a practical, healthy means of transportation. 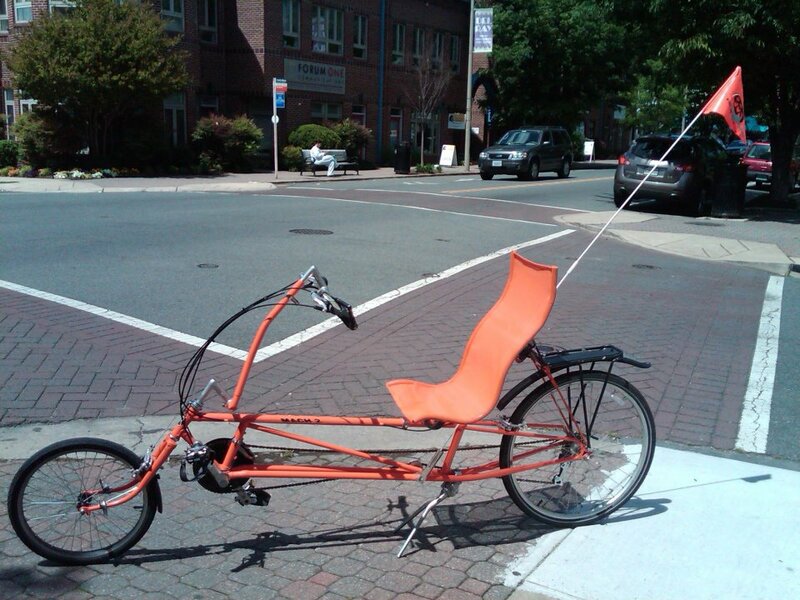 While researching and reading about recumbent bikes online, I discovered that there is a subculture of bike builders who design and build home-built recumbents. Often these are assembled from parts from other bikes. One such builder builds a brand he named Recycled Recumbents. The fact that it is built from chopped up and welded together steel frames from old ten speed bikes and used components and parts, is where it gets the recycled portion of its moniker. The builder refers to this bike as a clone, because it is patterned after the Easy Racer Tour Easy model. One day when I saw a photograph and advertisement for the grand opening of a local community bike shop named VéloCity Bike Cooperative, I saw in the background what appeared to be a Recycled Recumbent. When I stopped by the next day to see it in person, I found out it was for sale and bought it on the spot. Since I had ridden a bike to the co-op and could not ride both bikes back, I had to go back on the subway the next day to pick it up. Since I already had a Tour Easy at home and didn’t have a recumbent at work, I decided to keep it at the office so I could add some variety to my lunchtime bike rides. Because of it’s bright orange appearance, I named this bike Julius – Orange Julius. It was one of my favorite bikes, and I rode it and enjoyed it for years. So it was a difficult decision when I eventually decided to replace it. 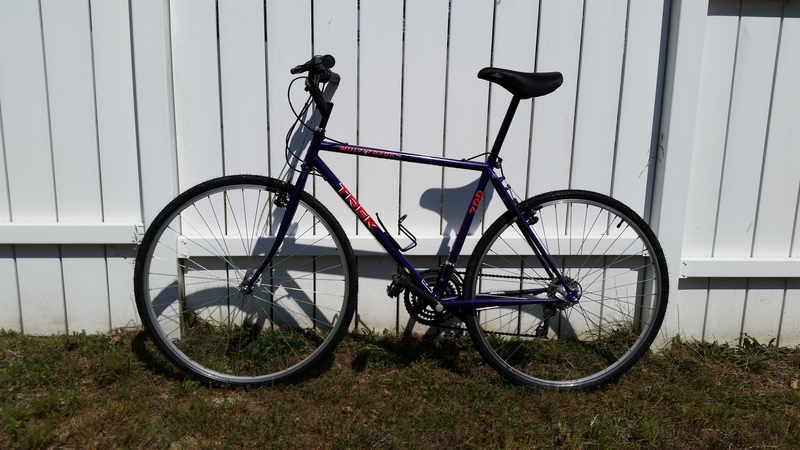 This 1995 Purple Trek 700 Multitrack was yet another Craigslist bike. It is also the least expensive bike I have bought thus far. And in addition to the bike itself, the seller threw in for free two new tires, a set of fenders and other accessories that were actually worth more than I paid for the bike. 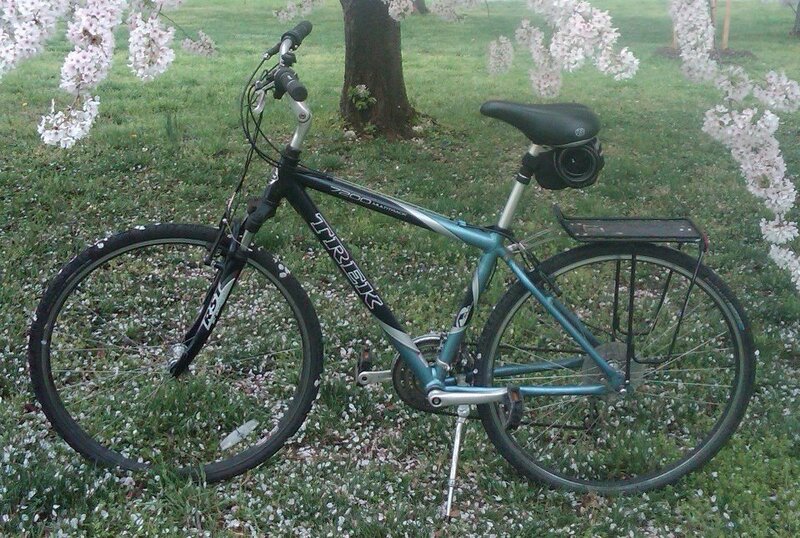 This was the first of the bikes I bought using the money which I received as reimbursement from my employer (see above). After years of faithful service it was eventually recycled by being donated to the Gearin’ Up Bicycles youth program. 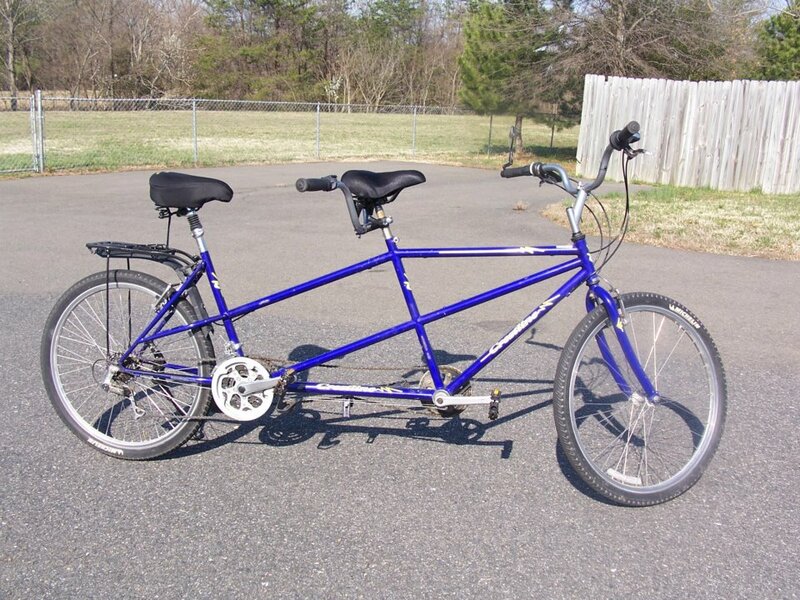 This was the first tandem I ever bought or ever rode. It was a 1998 GT Crestline Dyno Tandem that I bought from someone who sold it through Craigslist. It was a solid, heavy bike that served its purpose, but eventually was replaced by the Cannondale Street Tandem and sat in storage for a few years unused until I decided to let it go so someone else could put it to use and enjoy it. Having developed an affinity for Cannondale bikes, especially ones from the 80’s and 90’s, when I saw this 1991 Guard’s Red Cannondale SH600 on eBay I bought it despite already having several similar bikes. Cannondale describes this bike as having a “cross training” frame. So the next thing I did was look up what a cross training bike is, and how it differs from a hybrid. I found a copy of the 1991 Cannondale catalog, and read the description for this bike. It turns out that the description in the catalog states that this bike is part of “the 1991 lineup of Cross Training ‘hybrid’ bicycles.” The description goes on to state, “At the heart of the Cross Training models is a completely redesigned frame. Hand-crafted from large diameter, vibration-absorbing aluminum tubing, the lightweight frame converts pedal strokes into propulsion with a minimum of wasteful frame flex.” But in the end I think the use of the description “Cross Training” is simply a marketing tactic, because the bike is really the same as a hybrid. I put this bike together on my birthday, and took it out for the first time the next day. Unfortunately, it was stolen on my very first ride. I currently own and ride.